Drs. 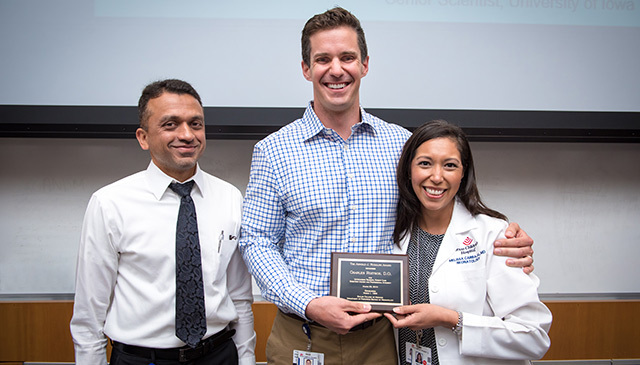 Muralidhar Premkumar (from left) and Melissa Carbajal, Neonatology faculty, congratulate third-year fellow Dr. Charles Roitsch (center), as the 24th annual Arnold J. Rudolph Memorial Grand Rounds award recipient. The award recognizes third-year fellows in neonatal-perinatal medicine for outstanding teaching, patient care, scientific inquiry and professional integrity. Dr. Patrick McNamara, a staff neonatologist and director of the Division of Neonatology at the University of Iowa Stead Family Children’s Hospital, and professor of Pediatrics and Internal Medicine, University of Iowa, was this year’s invited speaker at the recent grand rounds. Dr. McNamara also is the current chair of the PanAmerican Hemodynamic Collaborative and Paediatric Academic Society Neonatal Hemodynamics Advisory. The Arnold J. Rudolph Memorial Grand Rounds was established in 1996 by the Section of Neonatology, in the Department of Pediatrics at Baylor College of Medicine, in memory of its late Section Chief, Dr. Arnold J. Rudolph, who died in 1995. Dr. Rudolph was a well-respected clinician and educator, recognized internationally as a leader of neonatology.